The career of the Reverend David Garrow is described in his obituary which appeared in “The Gentleman’s Magazine and Historical Chronicle” of April 1805. In addition to describing his successes as a schoolmaster, husband and father, the article describes his last years with these words. Two mezzotint portraits of the Reverend David Garrow can be found in the National Portrait Gallery, both dated 1787, one by Charles Howard Hodges and one by Robert Laurie. both based on the painting by George Romney shown above. The original painting belongs to to a descendant of Mr Garrow and has not previously been available for public view. The history of this Romney portrait is an interesting one. It was sent out of London for safekeeping, together with other family pictures, during the Second World War, and stored in a depository in York. Unfortunately the depository was bombed, and a number of pictures, including one of William Garrow by George Romney (1785) were destroyed. (A black and white photograph of this painting is held the British Museum.) 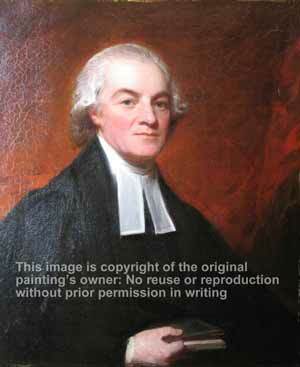 George Romney’s portrait of the Reverend David Garrow was damaged by the heat of the fire, and has just been restored. Now it is possible to see the colors and artistic treatment of George Romney’s work, and make a comparison with the mezzotint renderings of Hodges and Laurie. A more detailed account of the Reverend David Garrow can be found in the biography, Sir William Garrow, His Life, Times and Fight for Justice.